We know that work is changing. We know that there are technological processes taking place that will radically modify the way work will look like in a few years. You can call it digital transformation, fourth industrial revolution… as you wish, but we know that it will change work. We also know that we need to be ready. 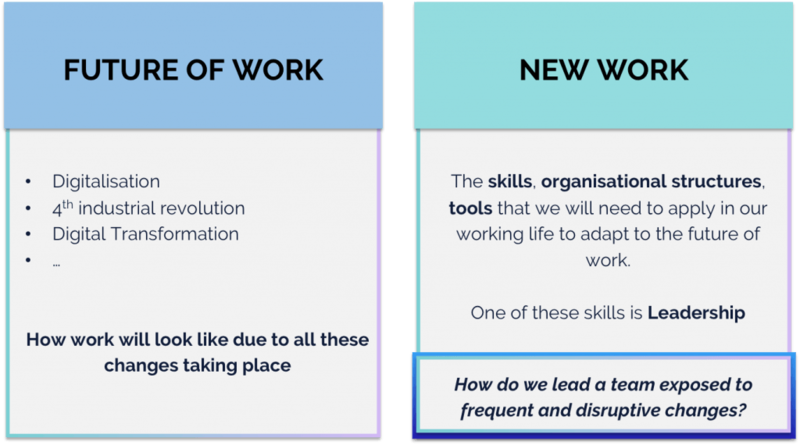 We need a new set of skills, new tools and new organizational structures that will help us cope both with the new setting and with the uncertainty of change itself. 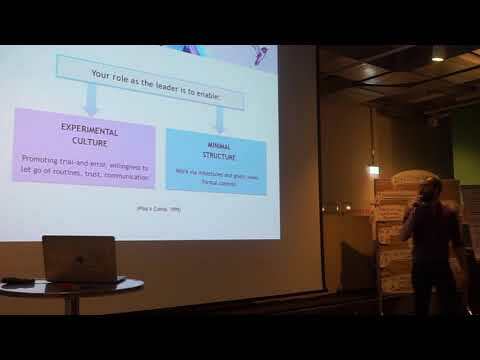 And one of the skills that we will need to work on is leadership – via leadership workshops. Specifically, we need a style of leadership that is right for a team that will be increasingly exposed to these change processes and will have to deal with huge amounts of uncertainty. So what behaviours can we expect from a team in such a situation? The first one is to trigger our survival instinct: we seek safety and want to feel safe. This is something that goes way back to when we were hunters and had to deal with life-or-death situations on a daily basis. We don’t anymore, but uncertainty is a sort of danger, and it still triggers that instinct. The second behaviour is exactly the opposite of the first one. Whenever we are faced with an unknown and unfamiliar situation, we can decide to fight our first instinct, let go of everything we know and make up something else with what we have. This behavior has even a specific name: Organisational Improvisation (Pina e Cunha et al. 1999), meaning you don’t have time to plan but need to act directly and keep on building on whatever it is you have just done – improvising within organizations. Here is an example of those two behaviours in action. In the 70s, there was a fire in a national park in the US (Mann Gulch) and a team of firefighters was called in to extinguish it. They were briefed on the fire and given information so they could prepare on what they could expect. When they went in, however, the fire started behaving erratically, meaning it did not follow any of the pattern they were expecting, or any pattern they knew at all! And to make it worse, they found themselves trapped in the fire. In this situation, the large majority of the firefighters followed their instinct and chose to feel safe in what they did, so they kept on trying the same routines, even though they knew they were not designed for that situation. A minority, instead, decided to let go of everything they knew and come up with something radically different, meaning they started a second fire, which in turn opened a way out – and of course they were the only ones to survive (Weick 1993). if you manage to go against your instincts and try something new and stick to it, you will not feel safe, and will need to keep on fighting your instinct, but it may up your chances of success. we need to build the right conditions to make it happen well. An experimental culture means a work environment where you encourage working via trial and error, allowing people to take competent risks and rewarding them for the resulting learning. This gives people the feeling they can trust their skills and they will not be punished because of a mistake, reducing their need for safety. A minimal work structure refers to how we as leaders structure the work process for our team. If we want to design, know about and control every single part of what our team does, we allow very little freedom to experiment and play. However if we decide to work with long term goals or milestones, we will still gets things done but we will also give people a sense of trust and freedom to experiment and get things done how they see fit. This is the work you need to do in the background. If those two condition are in place you can count on the fact that your team, the moment you need, will have the right basis to work in uncertainty. Once your team decides to jump in and experiment in a rapidly changing environment, their uncertainty will be even bigger, and their safety-seeking instinct is going to come in even more strongly! It will be up to you to make sure they don’t give into it. And if you want to know how to do this, there is a group of people you need to take a look at. I’m of course talking about improvisers. The link is a lot stronger than it appears. Improvisers are comedians – but are also teams working together in a highly changing environment, and exposed to full uncertainty. That said, they are also teams that manage to create successful products (shows) continuously for their clients (the audience), all while developing their products in front of the clients, adding even more pressure. So, if it is true that there is a similarity, and if it is true that improv teams handle uncertainty extremely well, it must also be true that we can look at how they do it successfully and see what concepts we can take from their work, transfer to our organizations, and lead our teams accordingly. Environmental awareness – This means being able to objectively observe, consider and process every stimulus or offer that comes your way. Awareness is a very important in connection with leadership, but most of the time we talk about self-awareness, which is something completely different. Self-awareness is also very important, don’t get me wrong, but not in this setting: the only thing that matters is thinking about what is happening outside and making sure you can observe and process every detail. Making the other person look good – On stage this means supporting and working with anything that comes from your scene partner. When it comes to teams it means entering a group of people and having the certainty that everyone else in that group will do everything in their power to make sure that you have full support, that your ideas are built upon, and that you feel trusted – and entering a group with this philosophy is an extremely strong safety net, exactly what you want. Recently, there’s even been a McKinsey study that connects being supportive to effective leadership. We know that our role as leaders is to lead in a way enables our team to enter that experimental state and work well in it. We know that improvisers manage to do all that by applying three specific concepts. 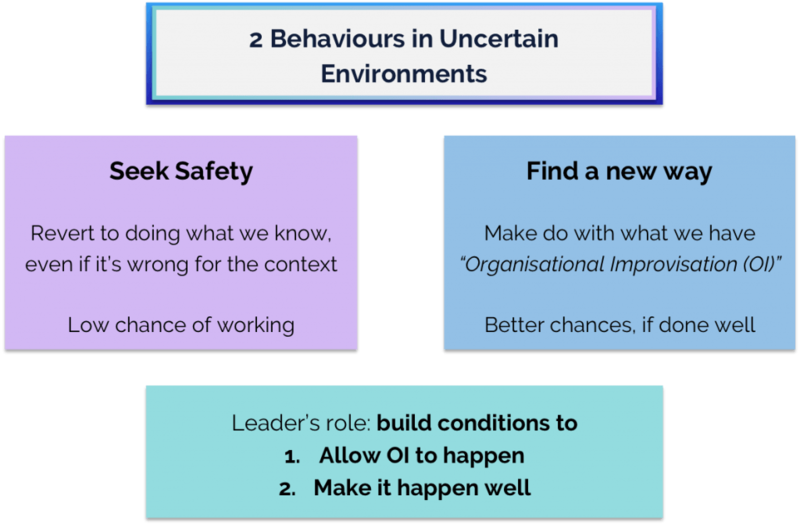 Out of the three concepts, the last one is particularly interesting, because it directly connects to two styles of Leadership that research (van Bilsen 2010) has showed to work under uncertainty. 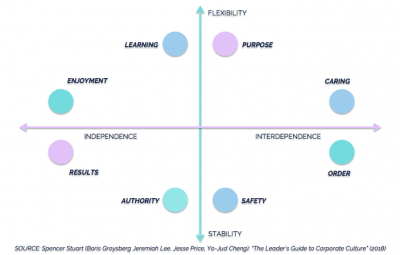 The two leadership styles we can adopt are Servant Leadership or Shared / Rotating Leadership (van Bilsen, 2010, Bass & Bass, 2008, Pina e Cunha et al., 1999). Servant Leadership requests that the leader have a low status, meaning that our main duty is to make sure that other people’s highest priority needs are being served in order to make them grow (Greenleaf 1979). In practical terms this means supporting and encouraging the team, taking care of menial tasks, sharing a vision, building commitment and credibility, and allowing for maximum freedom to the team members (Pina e Cunha 1999, van Bilsen 2010). This allows them to have enough freedom to work the way they see fit, including experimenting and taking competent risks. Shared or Rotating Leadership implies that the team member whose skills are mostly useful in each specific situation takes the role of the leader. Leadership is freely taken and given, independently of hierarchy. When the leader shifts, the whole team focuses on supporting that person’s efforts (van Bilsen 2010, Pina e Cunha et al 1999). Now, let’s roll back to what we started from: making the other person look good. If the leader makes it her task to make everyone else look good, she automatically gets into a servant leadership situation. If everyone, regardless of formal titles, makes it their task to make everyone else look good, they get into a rotating leadership situation. This also has the consequence that Servant leadership will be cheaper and quicker to apply, because only the leader requires training – but it is also less effective than Shared Leadership. Shared Leadership, instead is much more effective, (van Bilsen 2010) but requires everyone to be trained and on board, making it more difficult and expensive to implement, train and maintain. Whatever one you choose to apply, though, there is one thing these two styles of leadership have in common: they need practice. Knowing about them isn’t enough: you need to physically get into this and put your work in – only once you do will you understand how this works in practice. 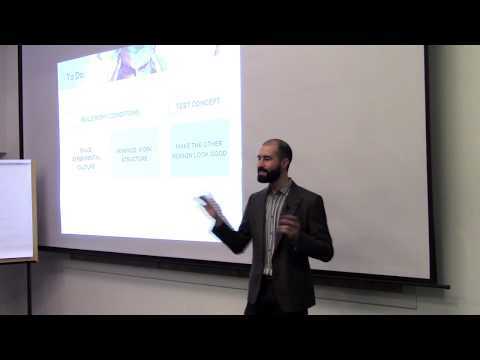 First, build the right conditions: experimental culture and minimal structure – for real though, not just by name: take a good look at what the culture in your company is in practice, and take a good look at how you structure the work, and if you are nitpicking or micro-managing. If there’s something blocking those two conditions, change it. Second, try for a whole day to make everyone look good. This means dropping whatever you are doing just to listen to someone, helping someone else even though you are in the middle of something, taking other people ideas on board, even if you don’t agree with them… Do this for one whole day and see what happens, see how you and everyone feels and see what the outcomes are, then draw your conclusions. If it sounds hard to do… it’s because it is! Once you try it, though, you will at least be aware of how to apply it when need to. Remember that change is happening, whether we want it or not – and so is uncertainty and New Work. Now do you want to try it or would you rather feel safe? Bilsen, G. V.: “Leading organizational improvisation: An exploration of the influence of leadership style on organizational improvisation” (2010). Pina e Cunha, M., J. Vieira da Cunha and K. Kamoche. “Organizational improvisation: What, when, how and why.” (1999).